Honors Legacy - Luxury diving in the Maldives - Book now ! Honors Legacy is designed and built by The Offshore Naval Architects in Alifushi of Raa Atoll, an Island community famous in the Maldives for skilled yacht builders and designers. This beautiful wooden yacht for 16 persons has 4 decks of comfortable living spaces where the lower deck houses 6 elegant staterooms and main deck is for saloon, a bar, indoor and outdoor dining arrangements. 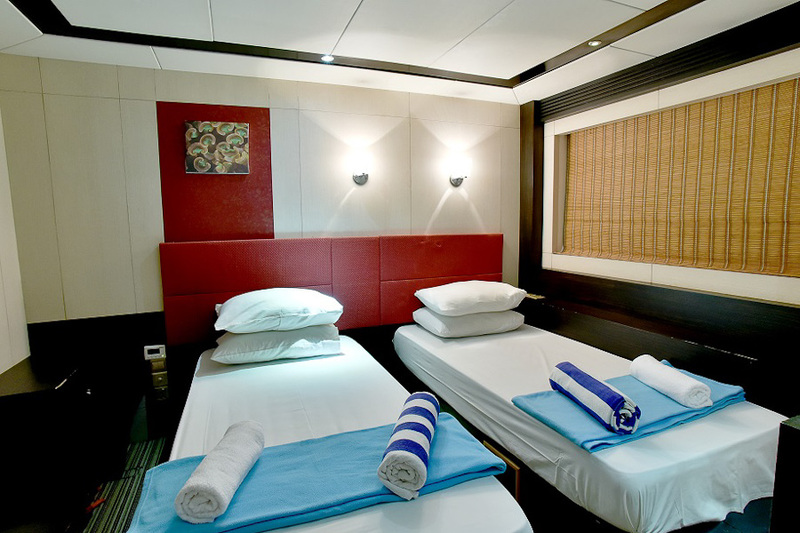 The bridge deck has 2 spacious ocean view suites (20 square meters in each), spa treatment room and wheelhouse. 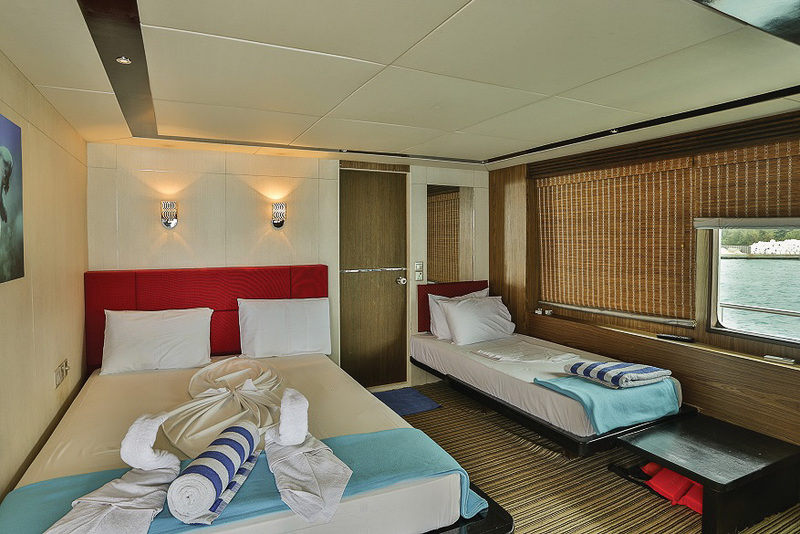 The sun deck is fitted with Jacuzzi, cushioned sun pads and sun loungers. Honors Legacy has the conveniences of fully air-conditioned interiors, gourmet food, all the favorite alcoholic and non-alcoholic beverages, professional Spa treatments, multimedia Library, board games and a boutique with memorable souvenirs of the Maldives. The 33 meter luxury motor yacht has all the modern amenities like Full HD TV's, mini bars, safes, Wi-Fi, hot and cold fresh water, etc. in her cabins and bathrooms. It is equipped with Full HD TV in the Saloon and Blu-ray Disk player. The indoor dinning is served on its marble tables with cushioned chairs. The yacht meets the safety and security standards of the Maldives Cost Guard and Maldives Yacht Building Code as well. Exact pricing is available on the schedule here as prices vary dependant on the time of year and the length of the trip and sometimes special offers are available. Single cabin supplement for one person is +80% of the above prices (For example..Superior $2,415 + 80% = $4,347). If you are happy sharing with another diver the prices are as in the schedule. 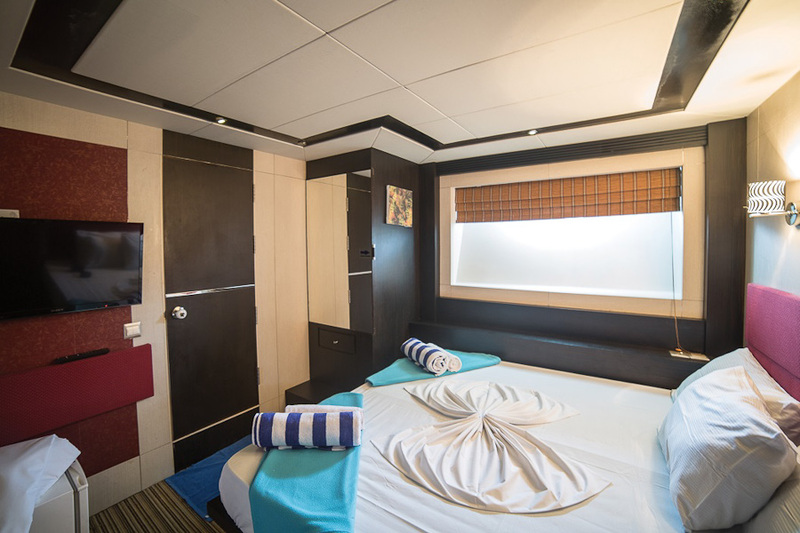 Total 8 cabins, 6 Staterooms 2 Ocean View Suites for Double or Twin occupancy. 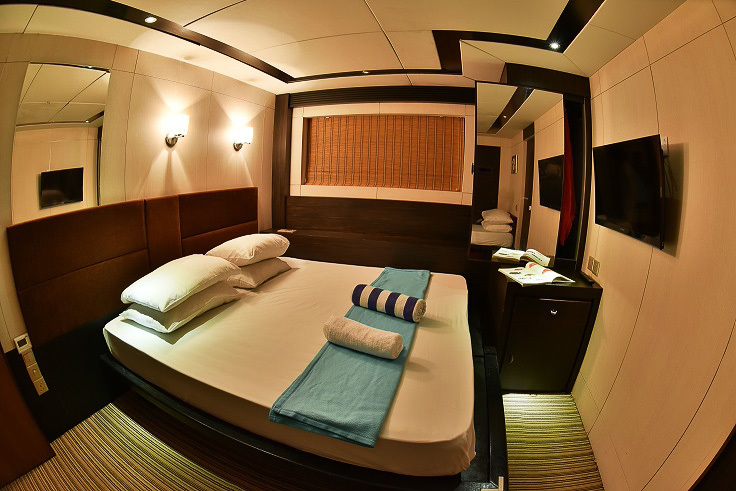 All cabins are air-conditioned with gorgeous interiors and trendy fittings, en-suite bathrooms with fresh hot and cold waters, mini bar, safe and Full HD TV with DVD players. Honors Legacy is one of the most elegantly built luxury motor yachts in the Maldives and an experienced crew onboard assures your charters are well delivered to suit the purpose of the guests. Facilites on board include a spacious lounge deck, air conditioned saloon with restaurant and bar, sun deck with bar, shades with Jacuzzi and sun beds, Spa with indoor and outdoor treatments, Boutique, Wireless Internet Access, Full HD TV and Blu-ray Disk player with surround speakers, Karaoke System, Board Games and multimedia library. Please enquire about your preferred dates - as Honors Legacy is only available for full boat charters and not individual bookings most dates can be accomodated. Honors Legacy leaves from and returns to Male but doesn’t follow a set itinerary as it’s all about the giving you the best diving possible. Asyou may know the Maldives has 2 very distinct currents running at different times of the year and this effects which side of the Maldives all the marine life is on at any particular time. Basically, dependant on the currents and the winds, we will select the route and dive sites. Our divemasters are very experienced in the hunt for whale sharks, Don’t worry that you might miss the other stuff though; Honors Legacy visits the best dive sites in the area to see sharks, mantas and all the schools of fishes and stunning reefs that the Maldives are famous for just like any other boat but we will also try really hard, and normally succeed, to find you a whale shark. It is the experience of a lifetime to swim with one of these gentle giants - don’t forget to bring your snorkel as you never know when we may run across one of these giants. For your flight arrival times ideally you should aim to arrive around midday on the day of departure as due to a same day turn around of the boat the guests from the trip before will be departing in the morning. The rest of the morning the boat will be being cleaned and prepared for your arrival around lunchtime. You can arrive on the day of departure as late as 10pm as the boat will not leave the Male area on the first day. Whatever time you arrive on the day of departure you will be met off your flight at the arrivals area by our boat representatives and taken to the boat, about 10 minutes from the airport. If you would like to arrive the day before it is possible to stay in the airport hotel which is on the adjacent island (HulhulMale) as the airport (Hulhule island) or stay in another guesthouse on Hulhulemale Island for the night, we don’t recommend booking somewhere in Male as this involves a ferry ride to the next island. If you stay on Hulhulemale island your hotel will then deliver you back to the airport the following day (the day of departure) where you will be met by the boats representatives and taken directly to the ship. Please check with your hotel / guest house if this is a free transfer as some of them charge for this service. Planes do not fly late into the night so you will be able to sleep. The day before there are only 2 dives ending around lunchtime so you may fly out in the late morning and still have the requisite no fly time required - Always refer to your dive computer for this but PADI recommends 18 hours. Wooden hull (Tholan timber) with upper water line fully laminated with polished fiberglass. Samyung 36 miles marine radar system, Eco sounder, Compass, map, Fish finder, Global Positioning System (GPS), CB Radio, Mobile Phones, Internet, Search Light, Binoculars, Map. Addressable fire alarm system in all rooms and public areas, fire extinguishers, life jackets and life buoys. 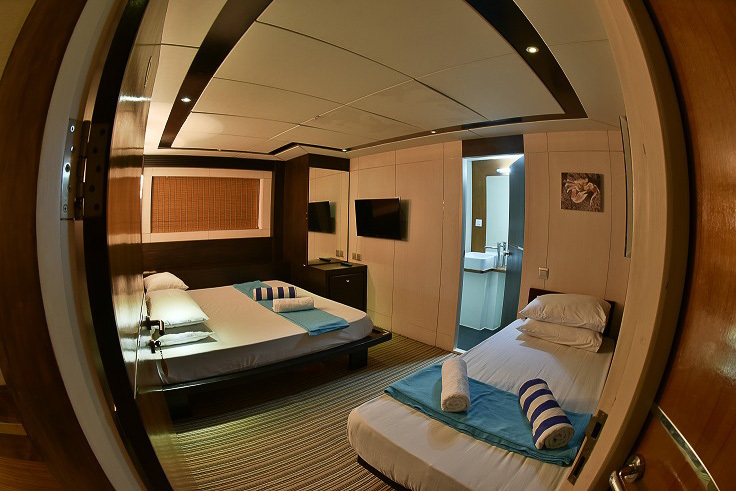 Total 8 cabins, 6 Staterooms & 2 Ocean View Suites for Double/Twin/Triple accommodation with Jacuzzi at the bridge deck. 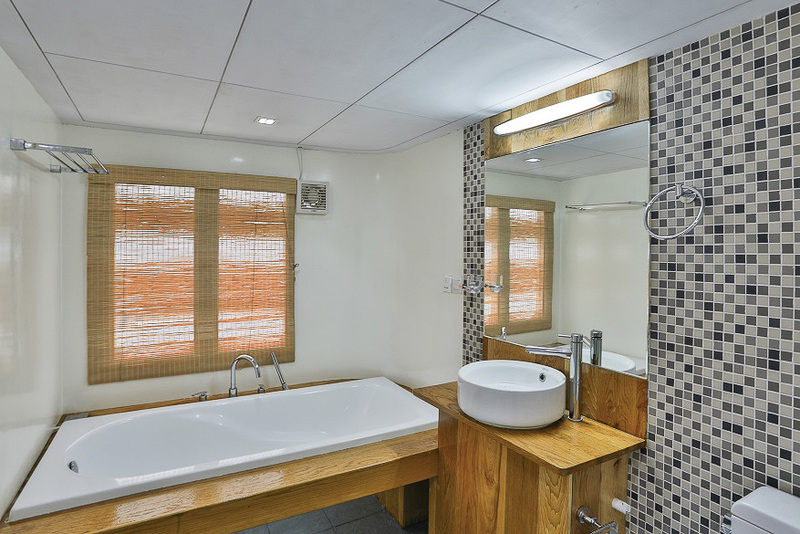 All cabins are air-conditioned with gorgeous interiors and trendy fittings, en-suite bathrooms with fresh hot and cold waters, mini bar, safe and Full HD TV with DVD players. Total 13 Crew onboard, including Captain, Engineer, Cruise Director, Chef and Spa Therapists. scuba diving, surfing, fishing, snorkeling, swimming, Island visits to Resorts, Inhabited (local villages) and Uninhabited (desert) Islands, BBQ on Desert Islands. Spacious Lounge deck, air conditioned saloon with restaurant and bar, sun deck with bar, shades with Jacuzzi and sun pads, Spa with indoor and outdoor treatments, Boutique, Wireless Internet Access, Full HD TV and Blu-ray Disk player with surround speakers, Karaoke System, Board Games and multimedia library. Fully equipped PADI certified Diving Dhoani, Dinghy with 50hp outboard engine, Fishing lines and gear, Fish finder, Snorkeling gear, Life Jackets, Life buoys, Fire Alarms & Extinguishers, Sound Proof Marine.